Happy Monday All! I am still recovering from my very busy and fun weekend. My sister got married on Saturday so I've had a lot going on. I feel like I've been away from the kitchen for weeks instead of a few days. 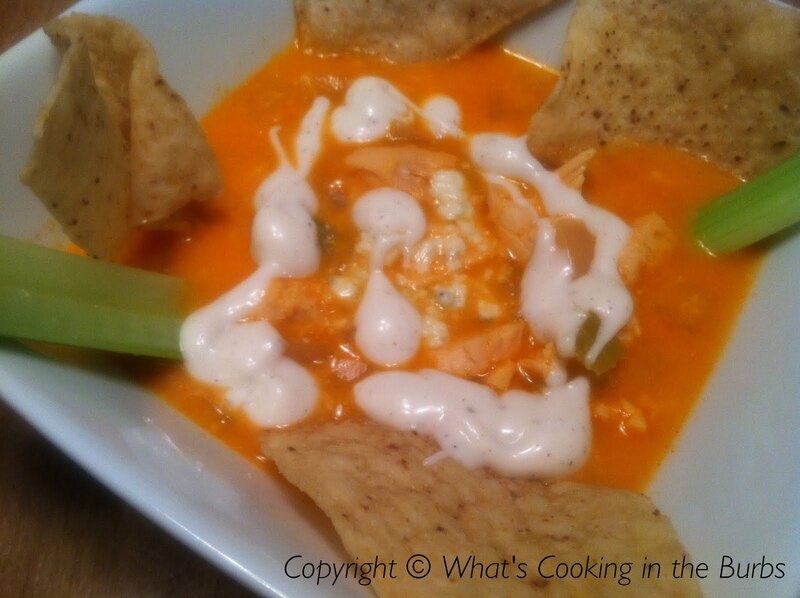 This Buffalo Wing Soup recipe was literally screaming my name. As you all know I love anything "Buffalo" and I'm obsessed with my Crock Pot. I knew I had to make this recipe and today is a prefect day for some spicy soup! Add your chicken breasts, chicken stock, garlic powder, onion, and celery to the slow cooker. Cook on low for 4 hours. Remove the chicken, shred, and return to the slow cooker. Add in your milk, cheese, and buffalo wing sauce. Continue cooking for another hour. Top with blue cheese crumbles, tortilla chips and ranch. Enjoy! Hi Bridget, just letting you know that your link to Food on Friday: Slow Cooker was featured in my Need Some Inspiration? Series today. Have a nice week. Wow! This is so simple and sounds so good. Thanks for bringing it over to our Super Bowl/Chili party! hmmm it's all about the great party food here! Thanks for sharing at Show Me Your Plaid Monday's! This look fantastic! I love soup and I love wings... never thought of it together! I haven’t eaten Buffalo wings cooked this way yet, honestly. But this is making me salivate! :D The thought of chicken soaked in milk, cheese, and tasty spices is absolutely tempting! I should try this one over the weekend.